This was my third visit to UK games Expo in the last three years and I have seen the conference progressively grow as the exhibition uses more of the NEC halls. In now resembles a mini Spiel on mini GenCon and is such a change from the first ones held at the Clarendon hotel many years ago. 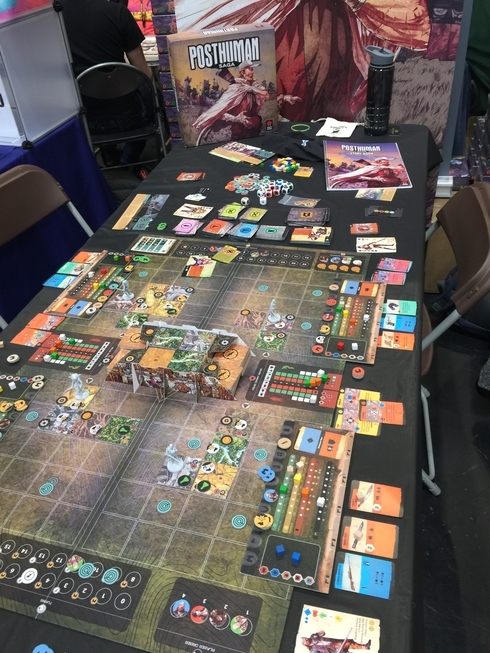 The expo caters for board gamers, role players as well as having many competitions so in that respect is more like GenCon. One area where it falls short of the very large conventions is in the launch of brand new games. Nonetheless all areas of the show have expanded and now occupies the best part of two large halls. The convention guide book covers many of the events that are taking place with a good indexed guide where all the stands are. However the numbering policy is still a mystery to me though this is mitigated somewhat as the stand numbers are highlighted on the floor. The main entrance for me is of course, boardgames. While retailers managed to bring huge quantities of games to sell, the new ones that spark the most interest. Many of the games are in various stages of Kickstarter mode. Some underway, some will be launched in the coming two months and some aim to be launched but no one knows when yet. The top game for me was Teotihuacan: City of Gods, from NSKN in which each player commands a force of three worker dice, which grow in strength. I played one third of the game and received a good rules introduction.The board is a rondel of 8 large tiles, two of which are fixed. Your 3 dice move clockwise round the rondel and activate the location that they move onto. You can pay the cost of landing (one cocoa per previously coloured die there) then carry out the location benefit or receive cocoa for each previously different coloured die. Nice – as you run low on your cocoa (which is the trading currency) you can restock. However, having more of your own dice on the same location provides a bigger benefit when carrying out the action, so you want to bring more dice. However, this costs more actions to coordinate as the dice only move up to 3 spaces per turn. The other resources are picked up at other tiles – wood, gold and stone and used at other locations to make progress on a variety of tracks. The other main improvement is that most locations allow you to increase 5he value of your die by one. Many locations provide better gains with higher valued dice and once you turn the die to 6 this worker retires but gains a big benefit and returns as a 1 pip die. There is a timer in the game – complete rounds – which may reduce by the number of retired dice. There’s 3 eras of this. One of the best actions is to lay a tile to increase the size, height and value of a temple, which triggers gains on a variety of tracks as well as scoring VPs. I loved the game, which is by the chap who did Marco Polo and Tzolkin. 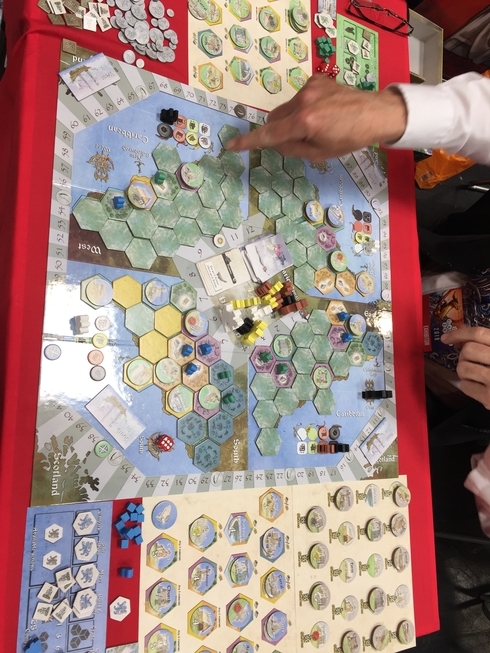 The game is out in Essen 2018 from NSKN. Auto acquisition. I also played the new detective game from Ignacy Trzewiczek with two other players. It is based in the current time and you have a case to solve using the computer which accesses the Internet site they have designed as well as discussion amongst the players from the clues received on cards. You have four days of eight hours to solve the case and are given a brief introduction and overview of the situation. From there it is fairly free format that you are given some clues to follow up and some Internet links to consider. Some of the Internet links are real events that took place that are woven into the storyline. As we were taught the rules I don’t know what the rulebook is like but the game played extremely well. There were five locations to visit and each time we moved locations there was a time cost of one hour. Each action in that location took up to 3 hours so in practice we probably had 15 to 20 turns throughout the scenario. As we uncovered the plotline we became increasingly aware of the story and then started searching for more evidence to support our theories. It did really feel like a detection of what was happening sparked by clues. However, the number of clues expanded like branches of a tree and we never knew whether we were following the right route or barking up the wrong tree. Sometimes we would receive a bonus because we uncovered a key plotline. At other times we got higher levels of stress as things did not go according to plan. The cards that provide the additional clues are text heavy though some also have diagrams and pictures to examine. Usually we could only see one side of the card but by spending some of the skill tokens we began the game with, we were able to see the reverse side of the card. The cards were tarot sized and so contained quite a lot of information as well as potential clues to follow-up on if you wanted to. 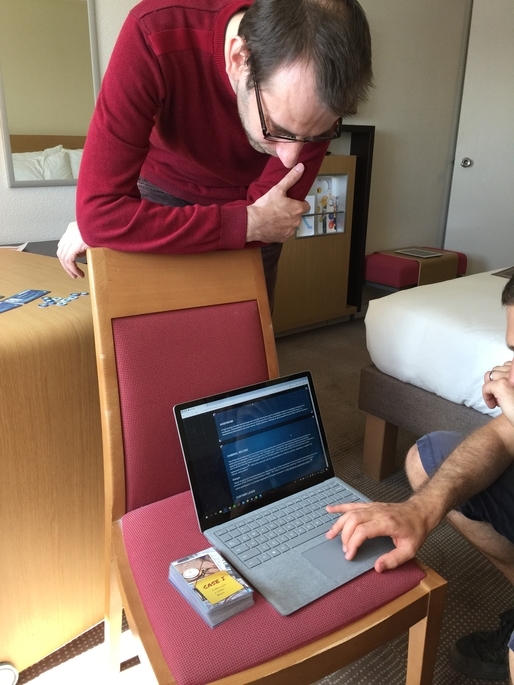 The game is probably best played with three people-one is the reader of cards, one as the computer analyst and one as the note taker. We finished the game in just less than three hours and got 100% of the plotline right and 67% overall score as we did not get all the evidence. The way the game judges this is to ask a series of questions at the end of the game when you choose to stop. This determines how well you did that the questions are not perfectly correlated with what you have picked up so you have to make your best judgements about when answering the questions. The first scenario links to the second and we got some clues from the first scenario that help with the second and fourth scenarios (there are five in total). The game was very interesting, engaging and had heavy storylines to follow up on we only used about 15 of the 40 cards available for this scenario so I suspect we could play this again although the plotline has been discovered so we would only be playing to get on her score or perhaps improve our knowledge of the future scenarios. So the game has some feeling of the Exit series in that it’s less likely that you can play the same scenario multiple times but not impossible. I really enjoyed this and the game is being launched at Gencon 2018. Next up was a game called Farsight from a chap in Swaffam (Norfolk). It’s a 2 player or two versus two player tactical battle with mechs and all that stuff. The idea of the designer is to simplify everything and so combat was easy to assess on the board. You could win by wiping out the other player’s units or capturing eight of the 12 areas with victory points on them. The trick in this game is that there is a set up at the beginning of the game which involves locating your spies on a secret board. This is a bit like battleships and as your opponents play they guess a location where the think the spies might be and you have to tell them the distance in squares that your spies are located. If the spy is our adjacent to enemy troops they can severely damage them. It seemed to work well but for £55 I thought I’d pass but in addition there was a further £55 for the very nice miniatures. The game was launched on Kickstarter successfully and is going to backers this week. I bought a game called Drop it from Kosmos games. It’s very simple. There are two perspex pieces into which to drop a variety of your own coloured shaped pieces. Rules can vary but by and large you can’t touch specific shapes or colours, while scoring points according to the rules of the round. It’s a quick game and should be hit with families and also game is for a 15 minute game. There were plenty of minis on display. 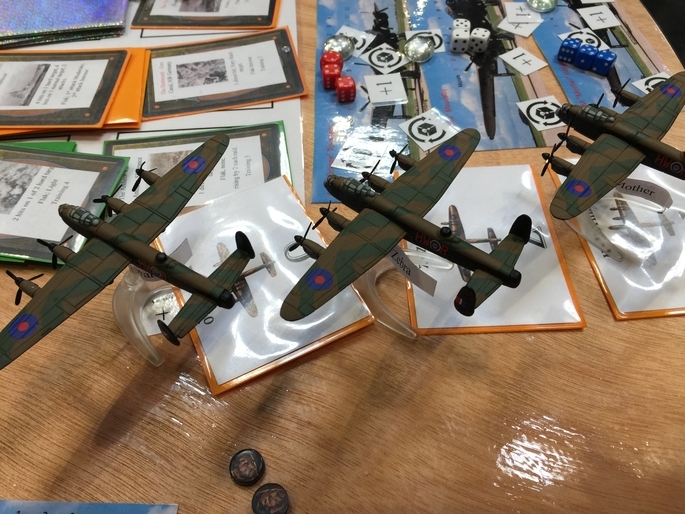 I really like the look of a dambusters game which had fantastic looking for Lancaster bombers. I suspect this will come to Kickstarter in the coming months. I didn’t bother to try and play the game but it looks very interesting. Another game which is due out very soon as the game from Z man games. It’s called Lowlands and looked a bit like the game is from very Rosenberg. You had to raise a dyke as high as possible to combat a sea that was rising from flooding your lands that were populated by sheep. I suppose if you like sheep games this is a must buy but it looks like it will be around about £50 so for me it will be a try before buy. 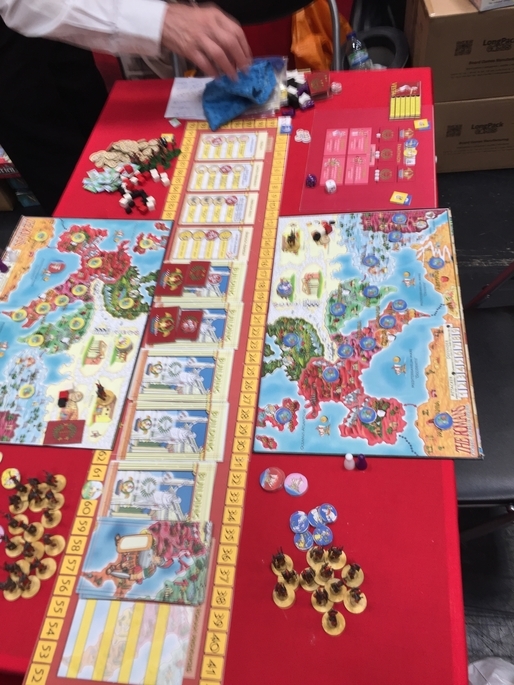 I obtained a copy of the next evolution of Century spice road called Century eastern wonders. This game is significantly more complicated than its predecessor as it introduces a tile element where you have to move your boat across these tiles to acquire the trading options from each island that allow you to store the right combination of cubes to obtain the points from the orders placed at the edge of the board. So while the objectives are very similar to the earlier game I suspect the game links is probably closer to an hour then the 10 minutes of the earlier game. One of the “clever“ features of the game Is that you can play a game that links the two games together. Both roll sets for the basic and combined games are on one piece of card each so at least the rules are very set synced. I have yet to try either version. Back to demos. I went by the Ragnars stand and saw their new game called Darien Apocalypse. It features the quantum game system that they introduced in their previous game. I did not like that game very much so was dubious that this would be any better. I suspect some of the things that I had its problems in the earlier game have been resolved and it has become much more complex as you send your Scotsman to discover New lands, uncover the tile and add buildings to the land which provide special abilities. I like the game quite a lot and was asking each player gets their own set of buildings that they can upgrade to. There seem to be a significantly lower (possibly non-existent) take that element that I previously did not enjoy in their last game using this game system. Their next game looked even more interesting.It had the same Quantum system but this time set in the Roman era. The little but I did pick up on Waze that you energised a collective said it, for barbarians in your own map area but the dice rolls that you got with the same time so that everybody else got. It certainly looked like a very interesting evolution of the system and I would like to play it sometime. Along the same corridor was Cubiko games. Gavin produces a limited quantity of each of his games and I was keen to see what he had for sale. I picked up two games one was a cycling game one (Velodrome) was a game based on risk (Para). The latter featured a 5×5 grid of countries where each of the borders has a raised wooden border so in order to attack you must parachute in your cubes or move in your cubes to the next area. Then dice are chosen and casualties taken. It’s a 45 minute game. Velodrome is a game your movement chips to move your cycles round the track. You score points as you pass the start line which vary between 1 and 4 points. Each round 2 chips are chosen and the lowest set starts, moves any cycles though if not their own, the owner selects the route and then passes the chips to the next player. Looks interesting. My final acquisition was a game called Crystal Clans a 2 player card game from Plaid Hat Games. Looked interesting and I took a punt. Overall the show has grown in space by 25% to 50%. Numbers of people was up but it was not too crowded. Demos were everywhere and all were pre Kickstarter status. Some were ready to go and some were a mile away. And some games had big booths but probably bought too much space. Finally some games of interest that are due out later this year or early next. 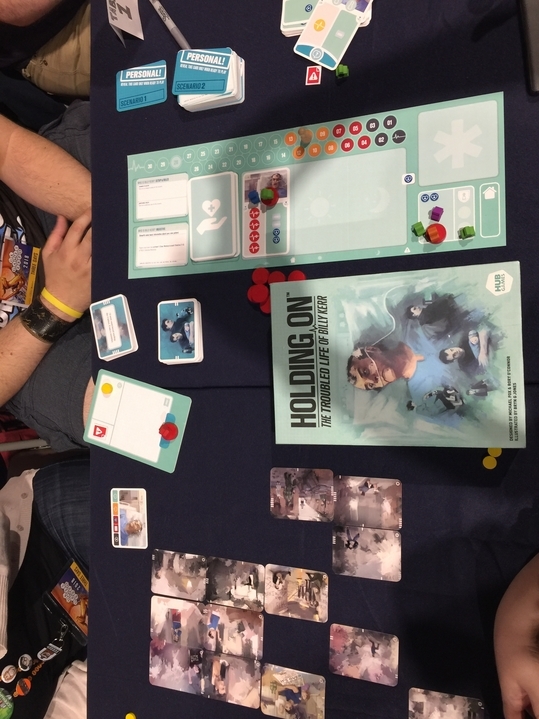 Holding On is a cooperative game about supporting a dying old man, or at least not in good health. Your support can increase his health at which time he tells you about his life story and you receive a jigsaw puzzle of his life. Scenarios are to solve a particular puzzle and it is a very unusual game in an interesting format. Maybe too close to home for some? 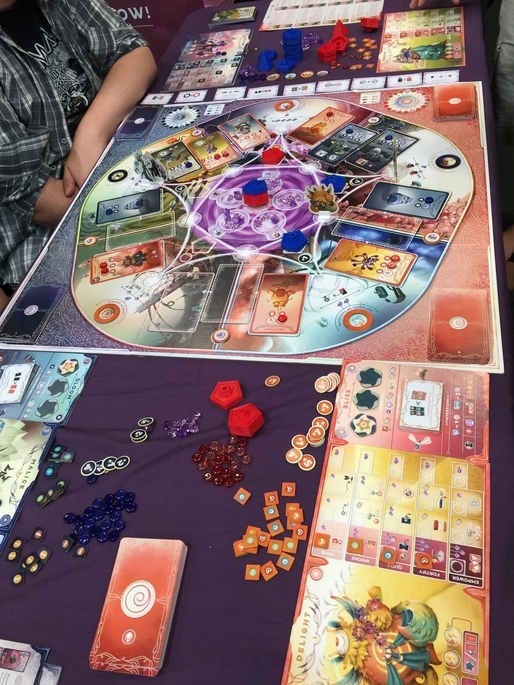 This is the latest game from Mindclash Games called Cerebria – the inside world. Inside your brain all these emotions,action selection options and area control or at least that’s the interpretation this game provides. With all these competing emotions which ones will come out on top? For gamers like he it will be the acquisition disorder emotion and the game looks beautiful. Coming up on Kickstarter right now is Posthuman Saga which looks sufficiently intriguing that surely you must back it on looks alone? 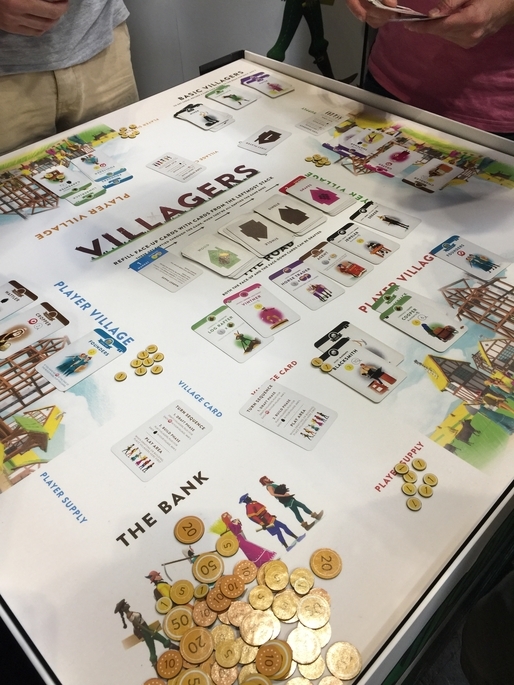 Villagers was another Kickstarter getting a lot of attention and it was hard to find space to get a demo in. My quick one liner was a more complex game of Majesty for the realm from last year. 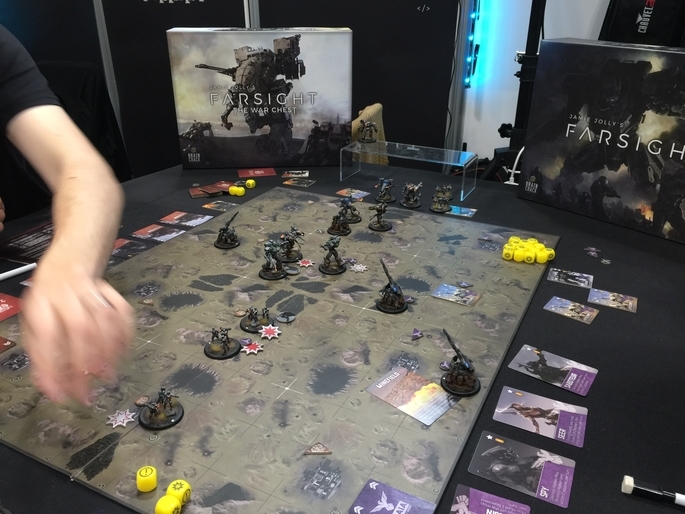 UKGE continues to grow in size , interest and quality. I suspect a similar level of growth would be reasonable next year. If a few (more) publishers could link their launch schedules to late May, I think the Board game element would be phenomenal. As it is it’s now got a place in my diary each year. That first game you described that begins with a “T” sure sounds like a good one. I’m keeping my eye on it. Thanks! Like Jacob, I have been very curious about Teotihuacan, so I’m very happy to hear you’re so enthused about it, Alan. 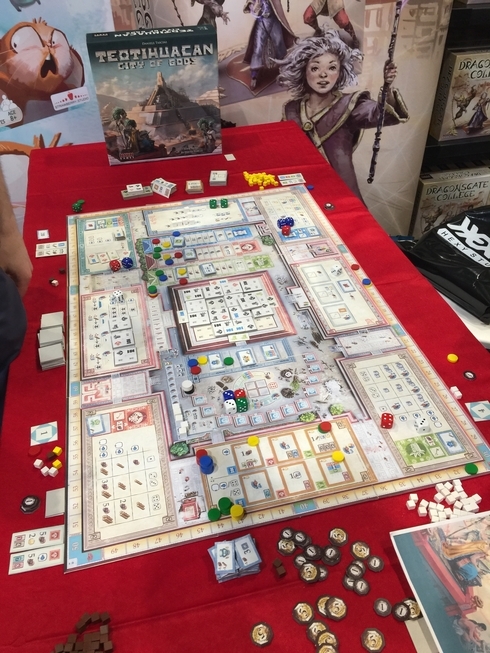 I love the games of Luciani and Tascini (like Marco Polo and Tzolk’in), but while Luciani has had success without his partner (including Grand Austria Hotel and Lorenzo il Magnifico), Tascini has no such track record. So great news. This is now one of my most anticipated games from Essen–the description really sounds terrific! Thanks, Alan!